Kitchen window blinds are a vital aspect of interior design for kitchens of all varieties. No matter the décor and style, there’s a type of kitchen blind for your kitchen. When you sit down and look at your choices, however, it’s normal to feel as though there are too many options and you’re unsure which blinds are right for you. So, when you’re looking for kitchen window coverings, what are your choices? What Types of Blinds are Available for the Kitchen? There’s no fixed rule on which blinds are best for kitchens, but there are certainly some types of kitchen blinds that are more popular than others. 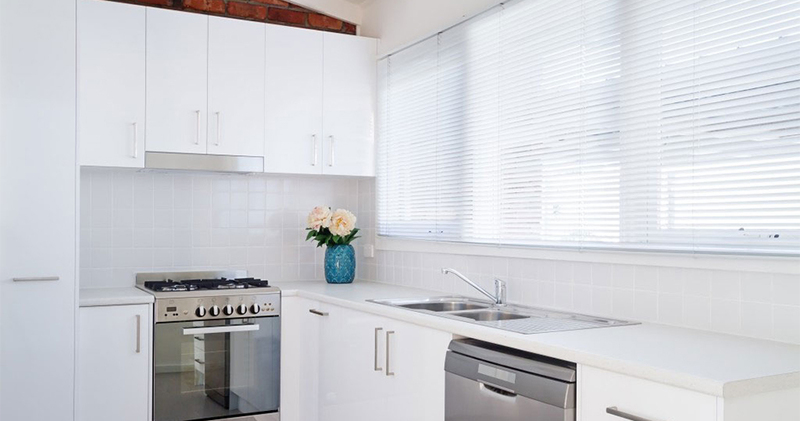 Venetian blinds remain an elegant option for kitchen blinds UK wide, and they’re compact enough to make even the smallest kitchen windows seem well dressed. These blinds are available in a wide choice of colours to ensure compatibility with any design scheme. Roller blinds are also a popular kitchen option thanks to their simplicity and clean lines. Again, these are neat options for any contemporary kitchen with numerous fabrics available to choose from. Another option that you’ll find in kitchens across the UK is Vertical blinds. These are preferred by some as the amount of light let into the kitchen can be more easily controlled, ranging from opening the blind slightly to opening the entire blind for maximum light entry. Benefits of Having Blinds in the Kitchen? Blinds have rapidly become a favoured option for many people searching for kitchen window coverings and with this brings a lot of benefits of having blinds. Unlike traditional curtains, blinds are easier and cheaper to both clean and maintain. Some fabric window blinds can be cleaned at home, while it’s easier to clean PVC and wooden blinds effectively without expert intervention. In a room like the kitchen where there is a danger of food and water splashes, this could be an important benefit. Equally, the ability to better control the amount of light allowed into a kitchen can be useful for areas where food is being prepared. Kitchens are traditionally the hub of the home, and the connotations of a light and airy hub compared to one shrouded by thick curtains is undeniable. While one of the major attractions of curtains is often their free-flowing nature, this is a drawback in the kitchen. In fact, it can be downright dangerous in environments where hot items and cooking materials are used frequently. So, window blinds are increasingly seen as the safe option for kitchens as well as the stylish one. Wooden window blinds are an option that generally suits homes with matching décor, although they can be utilised both in traditional styles and in more contemporary ones. For instance, lighter coloured wooden window blinds are excellent for complementing a fresh and airy style, while darker wooden blinds might be more popular in traditional farm-style kitchens. A word of warning – the moisture in a kitchen could prove problematic for wooden blinds, so it’s wise to consider faux wood alternatives which have all the attractions but none of the warping. How Much Do Kitchen Blinds Cost? When you’re looking at prices for blinds, remember that a combination of fabric choice and design technicalities will contribute to the overall cost. It can be difficult to say exactly which blinds will be cheapest for a specific home, but these are some general guidelines. Roller blinds are one of the cheapest types of kitchen blinds UK wide due to their simple construction and the fabric used. Final costs will depend on the size of your window and the patterns you choose. Venetian blinds can cost a little bit more, as they have a more complex design which can increase the cost when made to measure. Maintaining and cleaning your kitchen blinds will improve their lifespan and ensure that they don’t become a haven for bacteria and grime. Whichever type of blind you choose, remember that you’ll need to access them to clean them and, often, it’s easier to remove the whole blind unit to better maintain them. Never use harsh chemicals on blinds, especially fabric blinds as it can stain them or discolour them. Equally, be careful when dealing with wooden blinds to let them dry effectively after cleaning. Incorporate cleaning your kitchen window blinds into your general cleaning routines and they’ll serve you and your kitchen well for years to come.